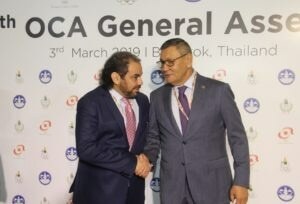 During the Olympic Council of Asia (OCA) General Assembly, which took place in Bangkok Thailand, Boxing was proudly represented by AIBA President Gafur Rahimov. While the General Assembly opened on Saturday night with a mixture of protocols, awards, presentation and traditional music and dance as well as Thai cuisine, the administrative portion of the General Assembly rolled out on the Sunday where all delegates were welcomed by OCA President HE Sheikh Ahmad Al Fahad Al Sabah and several VIPs including Thailand’s Minister of Tourism and Sport, Mr Weerasak Kowsurat, and the Deputy Prime Minister and Thailand National Olympic Committee President, Gen. Prawit Wongsuwang. Also in attendance was the IOC Member for Thailand, Khunying Patama Leeswadtrakul, IOC Member & IOC Executive Board Member Zaiqing Yu, FINA President and Honorary IOC member Julio Maglione and other VIP guests. 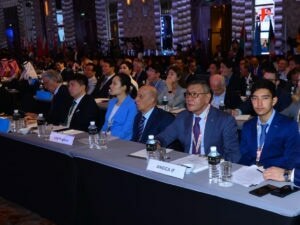 AIBA President met with several Asian NOC leaders, IF representatives and IOC members, including among others, NOC and National Boxing representatives from Thailand, India, Uzbekistan and Philippines. He stressed the importance of these meetings, which aimed to strengthen the position of boxing among all sporting nations in Asia. 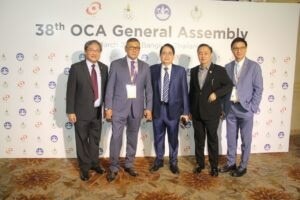 The post AIBA President represents boxing at the 38th OCA General Assembly appeared first on AIBA.